Arthur Miller wrote his adaptation of Henrik Ibsen’s 1882 play in the 1950s, around the time he wrote The Crucible, when McCarthyism was at its height. A 1978 movie version starred Steve McQueen as the eponymous Dr Stockmann. He’s vilified as “an enemy of the people” in order to discredit his findings that the all-important natural water supply to brand new spa baths designed to make the fortune of his home town is actually poisoned with highly infectious organic matter. Now, in its first London production for almost 30 years, director Phil Willmott has given Miller’s version a contemporary spin by setting it in Middle America in the Trump era (a clever cartoonish image of the orange one with a bottle of spa water is the poster image). He draws a clear analogy with the poisonous atmosphere that currently crosses continents, with the angry divisiveness of Brexit in the UK, ‘gilets jaunes’ on the streets of France and government shutdown in America in the current face-off between Republicans and Democrats. So to the strains of Bruce Springsteen’s ‘Born in the USA’, the lights go up on a Midwestern town apparently blessed with healing spa water, where carnival mood prevails as the almost completed spa’s open day dawns. The citizens of Kirsten Springs hope to clean up – that’s the mayor’s promise – and as the builders work to finish the baths on schedule, the town’s flamboyant female Mayor Stockmann is posing for the press in a tight red suit, set off with white hard hat, to grab these positive headlines. But her younger brother, town physician Dr Thomas Stockmann has treated patients taken ill after drinking the water. He’s just received lab test results revealing infectious organic matter in the water, which can only be remedied by reconfiguring the whole water system. This would disastrously delay the opening date and the hotly anticipated increase in footfall on which the town’s struggling businesses are pinning their hopes (so the current decline of the high street is in the mix too). The local paper is on side. It will be seen as crusading for truth and the revelation will sell papers. But our lady in red sees red and sets out to see off her little brother by dismissing the threat and discrediting him – and bullying anyone who stands in her way with the threats of the powerful and influential. The parallel with President Trump’s attitude to climate change is potent. To mix avian metaphors, if ostrich-like you bury your head in the sand, eventually your chickens are bound to come home to roost. Truth will out, potentially in the most disastrous fashion, if visitors become dangerously ill.
Our visit to Kirsten Springs ends long before ‘Armageddon’ though, with Dr Stockmann shouted down by angry townsfolk at a public meeting and then forced to choose between recanting and losing all, as a rock is hurled through his window. Going head to head in Willmott’s production are David Mildon’s passionate, naïve Doctor and Mary Stewart’s excellently sinister, strident narcissistic Mayor, clearly in the Trump mode, though frighteningly savvy by comparison. “I intend to see to it that the people understand”, she warns her brother and his supporters in the press. The local paper’s publisher gets cold feet and his minions, the editor and sub editor, play their part in turning the town against the doctor too. She goes in for the kill at a public meeting, striding confidently around the podium in a tight leopard-print suit in her trademark red (costume designer Penn O’Gara clearly revels in dressing Stewart); and it is perhaps no accident that she starts a chilling speech to whip up the crowd against her brother with “Friends…”, channelling Mark Antony. “We were nearly a casualty of the last administration,” she continues, aping Trump. It’s no wonder Dr Stockmann is shouted down, branded an enemy of the people and in danger from the mob. 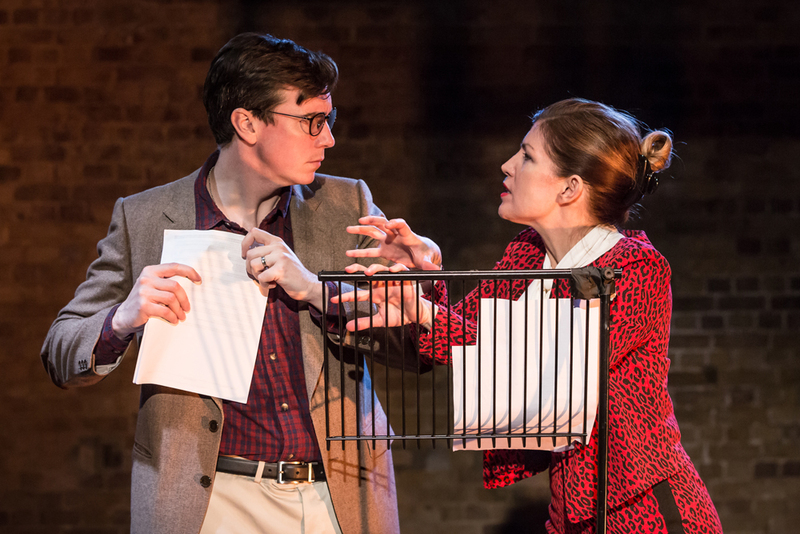 There is fine support from Emily Byrt as Thomas’s beleaguered wife Catherine and Janaki Gerard as his younger sister Petra, a schoolteacher of equal passion and integrity caught in the crossfire, as well as from Jed Shardlow and Angelo Leal as leaders of the press pack. Designers Justin Williams and Jonny Rust provide the half-finished timbers of the spa and Nicola Chang the scarily authentic soundtrack of angry townsfolk at that public meeting. The first half is slowed by blackouts between scenes, but the second picks up pace towards an inexorably sobering ending.